Electric unicycles are fun devices that provide hours of enjoyment and smooth commutes to work. Just like any electronic device, you might run into a few issues after owning one for a while. Is there anything that can be done when your unicycle malfunctions, or are you stuck with the cost of a new ride? Before you start panicking or fork over the cash for expensive repairs, there are some problems you can fix with your own two hands. 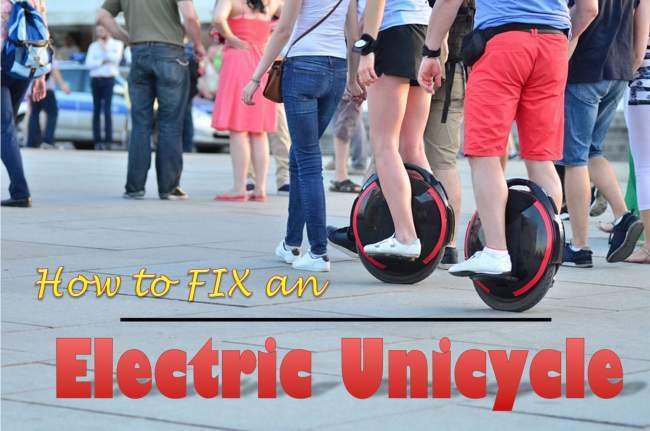 Follow this guide on how to fix an electric unicycle, and you’ll be able to repair yours like a pro. While some of the problems you might encounter have simple DIY solutions, other might be more complex and require the help of a professional repair service. Here are the most common issues unicycle owners run into. The device no longer balances. This one is perhaps the easiest fix on the list. Start by unscrewing and removing the cover over your tire, then lifting the tire away from the wheel. Next, you want to remove the inner air tube from inside the tire and the tire itself. Take a vacuum hose and clean the insides of the wheel and tire, then submerge parts of the air tube in water until you find the leak. From there, you simply need to apply an adhesive to create a seal over the source of leaking air. After filling it back up with air, simply reassemble the unicycle and you’re ready to ride again. In the case that the connections have gone bad inside the device, simply unscrew the cover to the motherboard and search for loose or disconnected links. Sometimes, you can fix this problem just by reconnecting the wiring. If reconnecting the wires didn’t solve the problem, then you might have a bad circuit. This means that the motherboard needs replaced. You can purchase replacements kits with simple DIY instructions on how to replace the circuit for your cycle. This problem is caused by both loose wiring and malfunctioning circuits. If none of the above cause the unicycle to balance again, then there are two things you can do. When looking at the wiring inside your device, you will see a small white rectangle connecting several colored wires. After turning the cycle off, take a pair of scissors and cut all of these wires from this box. Then, reconnect them to their matching colored wire and wrap them all in electrical tape. This completes the circuit, fixing any issues caused by the white connector box. Choosing to purchase new circuitry for your device is a much safer alternative. This gives you a reliable, functioning ride without having to worry about something going wrong from manually reconnecting the wires.